Happy Memorial Day | A.B.E. Remodeling, INC.
Just a quick note to wish everyone a happy and safe Memorial Day. Whatever your plans make it a pleasant day. 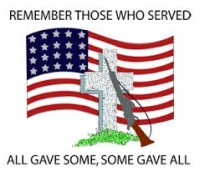 And remember some gave all and all gave some to give us the freedom we still have in the USA. Thank you to ALL those who served or are seving today. God Bless and have a great weekend.